One of my favorite collecting - and selling - areas is vintage ephemera. 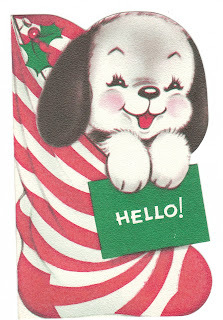 I particularly love vintage dog ephemera. 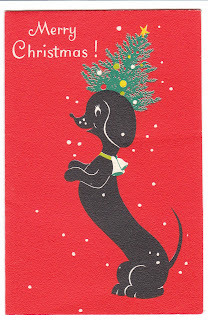 I collect vintage Dachshund ephemera (especially Valentines and Christmas cards) but that is another blog entry - or perhaps a whole separate blog! 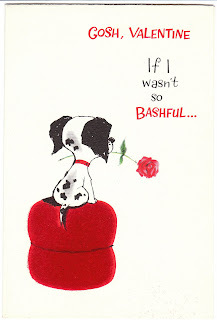 I love the cute, often whimsical vintage dog illustrations, of course. But it is also fun to peek into another time and see people with their pets. My axiom as an eBay seller has always been: if it has a dog, mention the dog. Prominently. In the title and in the description. 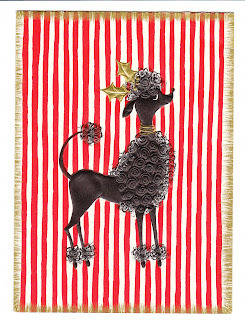 I also recommend being as specific as possible -- not just Cute Dog Card, but Cute Poodle Card, or better yet, Cute BLACK STANDARD POODLE Card. Although I started on line selling vintage children's books (and that will always be my first love), over time I've also come to really enjoy vintage ephemera. I have a big box of it here waiting to be listed (perhaps 400 - 500 pieces). It's a little like a treasure hunt; you never know what goodies you will find! I certainly hope there are more vintage dogs waiting for me in my ephemera box.